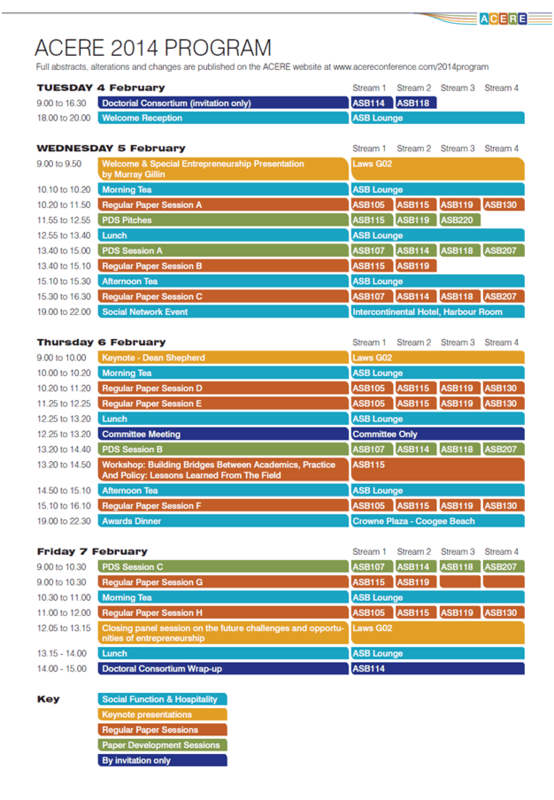 We are aware that the full ACERE 2014 Program has been released later than some of you would have wished and expected. Please rest assured that this is not due to any lack of awareness, effort or commitment on the part of the conference organizers. We have worked hard to provide a complete and correct program. However, a series of late cancellations and other unforeseen circumstances have repeatedly forced us to hold back and reschedule just as we thought we were ready to release the program. We appreciate your understanding and sincerely hope the program you receive here will not require further alterations. Full details of the Regular Paper Session are available here. Click here for full details of the PDS Pitching Program and the PDS 40 minute Workshop Program. Copies of these programs will be available for you at the registration desk. Copies of the ACERE 2014 Program will also be available in the handbook.